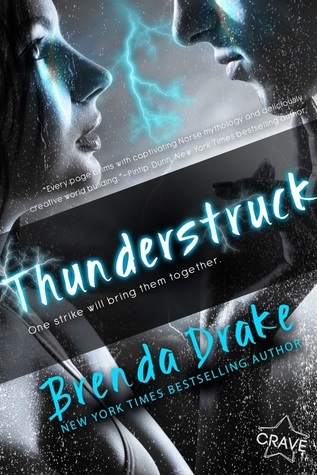 Thunderstruck by Brenda Drake [release date 9/11/17] + Giveaway! Today’s guest post was written by Brenda Drake. I met Brenda online years ago when #PitchWars and #PitMad were just starting out as contests for up-and-coming writers. Both contests have grown exponentially in recent years, bringing so many more great books to the market. The way that Brenda supports writers inspires me to give others more and thank others more. This one’s for you, Brenda. To me, music helps bring mood to a story while I’m writing. I need a playlist of songs that inspire and enrich the words and emotions as they’re entered onto the page. Songs breathe life into the journey the story takes the reader on, where everything is a little more frightening or sweeter because it accompanies the story so magically. Today, I’m thrilled to share the songs that inspired me while writing THUNDERSTRUCK. The THUNDERSTRUCK playlist starts with You and Me by Lifehouse. Such lyrics like What are the things; That I want to say; Just aren’t coming out right; I’m tripping on words; You got my head spinning; I don’t know where to go from here represent Blake’s feelings for Stevie at the opening of the story. He’s nervous to talk to her. Unstable on Midgard. Imagine Dragon’s Thunder actually doesn’t fit Blake as much as it fits his brother, Kyle. Lyrics like, I was uptight, wanna let loose; I was dreaming of bigger things fit Kyle perfectly. He’s always trying to get out of Blake’s shadow who is most favored by their father, Thor. And, I was lightning before the thunder represents Kyle and Blake. Kyle stave that shoots lightning and he’s older than Blake whose hammer sounds like thunder after he releases its power. 5 Seconds of Summer’s Jet Black Heart also plays into the brothers’ relationship. Kyle has always felt broken and he just wants to be better and loves Blake. The blood in my veins; Is made up of mistakes; Let’s forget who we are; And dive into the dark; As we burst into color Returning to life. OneRepublic’s Love Runs Out was a great song for one of the scenes where Blake, Stevie, and Kyle are running. It definitely describes Blake’s thoughts during this scene. I’ll be our light, your match, your burning sun; I’ll be the bright and black that’s making you run; I got my mind made up and I can’t let go. How could I not include Coldplay and The Chainsmokers’ Something Just Like This? It just fits the entire book perfectly. And this is how Stevie feels, I’m not looking for somebody; With some superhuman gifts; Some superhero; Some fairytale bliss; Just something I can turn to; Somebody I can kiss. And fun teaser, Blake finds it on Stevie’s playlist. Thank you for having me on your blog today to share the THUNDERSTRUCK playlist. I hope you all enjoyed it. What song inspires your writing or reading?